Mangrove fishing in the estuary around Damas Island, near the town of Quepos, offers a unique fishing experience. 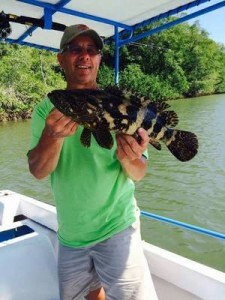 The mangrove fishing tour can be enjoyed by adults and kids. It offers a variety of Delicious Fish, such as the Red Snapper, Snook, Corvina and Mero. These species offer a good fight, as well as some great eating fish, whether cooked on the grill, fried, or prepared in a popular local sauce. There is nothing like sharing your fresh catch, around the table, with friends and family. We offer a 25 ft Panga with a canopy for shade. This 25 ft Panga has an amazing Captain named Andres, who has lived on Damas Island, his whole life and knows all the best fishing spots, really well. 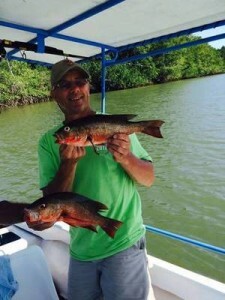 During your Mangrove Fishing adventure, Captain Andres will provide information and tips to enhance your enjoyment of this wonderful fishing experience, in the Damas Estuary. Your mangrove fishing trip includes refreshing cold drinks, delicious fruits, snacks, and sandwiches. 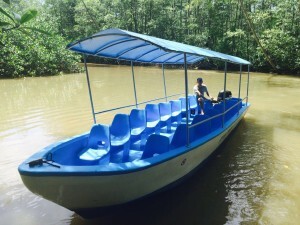 The Estuary’s Natural scenery is beautiful and provides interesting wildlife viewing, during the Mangrove Fishing Tour. It’s a peaceful boat ride, and a great chance to relax with friends and family. while reeling in some fish. During the trip you may encounter a troop of white faced monkeys, Iguanas and many species of beautiful birds. It’s really much more than a fishing trip. It’s also a terrific sightseeing tour. And, it’s all done in calm water. To book a mangrove fishing trip, contact us using the information found below.